If my thoughts were a butterfly, they would fly to you. Just to tell you that I dream of you every day and night. 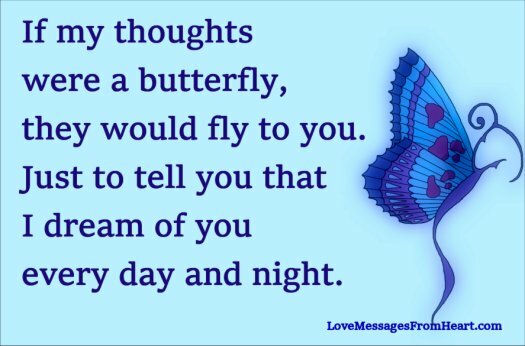 My thoughts are happy and peaceful, just like butterfly … all because of you. I dream of you and I … I dream of colorful butterflies and unicorns … I dream of love. I only saw grey and dark before, now I see all the colors. I had only sad, black thoughts before, now my thoughts are happy and colorful. You showed me love and you gave my life colors. Beautiful messages. It is well written.